Then The Trucker decided he wanted to head to Cedar Square for our favourite sushi spot and the new Bourne movie. I won't lie, I napped during the chase scene (it is pretty close to the end). It's long. And I haven't really watched any of the Bourne movies since the first one. He didn't seem to enjoy it much, because he loves the Bourne trilogy ... and this wasn't quite the same, or on a par apparently. It's fine enough, I think, if you go in with no real expectations. On Saturday I was up a little earlier than expected. The guy from Bayberry Kitchens was coming over to measure my kitchen (eep, should be getting the quote today or tomorrow!) and he was early! Haha, managed to be showered and dressed in time at least because he had to phone for directions because he couldn't find me on his gps! Shew. That was quite fun, I have high hopes for getting my kitchen done in the new year! The Trucker & I then headed off separately, him to work and me to buy ingredients for our Dinner Club Starter. Then when he got back we went to have a browse at some new tiles ... brought home 2 samples to test the feel of. We are both overwhelmingly in favour of one of them so far :) It is hard to tell from just one tile tho, I'm still nervous that it's a bit too dark. Then we went to his office to get some paper work done (faster with 2 of us) and then it was home to relax for the afternoon. In the evening we headed off to @Toxic_Mouse's place for Dinner Club. What an awesome evening! 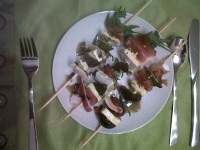 We had made @Tamara0h's Rocket, Black Forest Ham, Brie and Fig Preserve skewers, drizzled with Balsamic Reduction and Olive Oil. They were perfect. Such divine taste combinations and nice and light as a starters ... hate when you're too full for mains after a starter! For mains we had Nasi Goreng, which is basically Pork-Fried Rice, served with some scrambled egg omlette. Sprinkled with peanuts, Indonesian Soy Sauce and chili. Eaten out of Shrimp Chips, with a gherkin to cleanse the palate. I was skeptical when I saw the "sides" of peanuts, gherkin and shrimp chips on the table thinking these were the most unlikely combination of foods and flavours, but I cannot praise our meal highly enough. It was truly delish. Yum yum yum. @clairam & @obitadicta had brought a Woolies Ice Cream Chocolate Mousse cake for dessert. It all went down so well :) Along with a 2002 bottle of red wine The Trucker had brought from his cupboard. 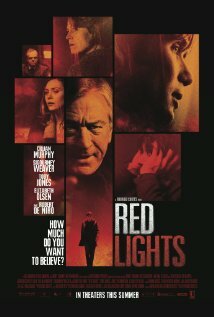 Watched a dreadful movie over dinner tho .... Red Lights. No, do not watch this. It makes little to no sense and although sounds interesting and has some nice big names (Sigourney Weaver & Robert de Niro) it is totally boring and at the end you're just so glad it's over you don't even care it barely made any sense at all.